4WD Type – This trek is for the Nissan G60 Patrol and other 4WD's types will be limited. Route – Depending on peoples location they are welcome to join or depart the group at any time. i.e. Brisbane people may wish to start from Birdsville QLD, etc. Oversea's Guests - It is possible that some Americans shall join us and may depart after the Simpson Desert. Therefore there is a chance the route may change slightly at Mount Dare to accommodate this. 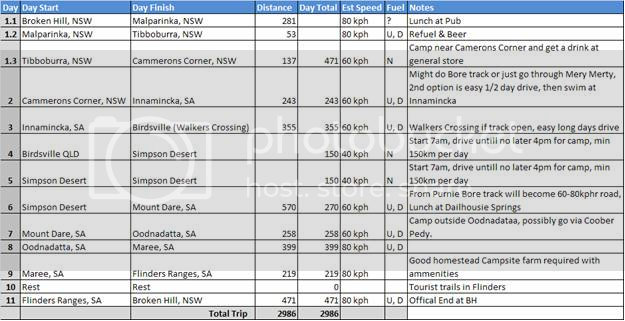 NOTES – Over the next few weeks the route, camping, passes, fuel, spares, etc shall be firmed up and posted in this original post. IMPORTANT – Only well maintained and cars in good condition should come on this trip. In many cases if your car breaks down it is a major feet to obtain spares or a tow. Therefore if you have any doubt about your car please don’t come. Saying that there isn’t much will kill a G60 and they are simple to work on, therefore please ensure your drive-line is fool proof. If a car does break down and we cannot get her mobile she would need towing. In that case yes we would tow her to the next logical place etc. As mentioned in Post 1 there will be more details as i work some additional information out and also write it up. Before any trek can even start I need to start getting a group together of definite people. The trek isn't 4wd hard but is a long distance with little to none outside support. This means if your car has a mechanical you need to have the spares to fix it, etc, better still if it is all top shape beforehand you reduce this risk. I will also be working out a suggested spare list for each vehicle and recommendations for fuel/ water/ camping gear etc. Again if your car has a major mechanical we may get you to a small town but we cannot tow your car 3000km home. So it is imperative you get your car in the best shape.